QuteCsound is a frontend for Csound featuring a highlighting editor with autocomplete, interactive widgets and integrated help. 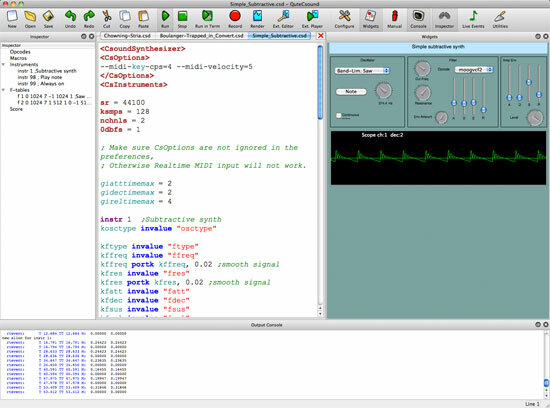 It is a cross-platform and aims to be a simple yet powerful and complete development environment for Csound. The fastest way to get up and running with Csound these days is to install QuteCsound, as it ships with a nice catalog of examples that range from beginning tutorials to synthesizers to complete compositions. There even exists many screencasts to help familiarize yourself with many of its built-in features. QuteCsound is the brainchild of Andrés Cabrera. This entry was posted in News by Jacob Joaquin. Bookmark the permalink.